Bognor are up to third in the Bostik premier after a 2-0 win at home to Hornchurch - their third win in four league games. Theo Widdrington - a day after starting a second month's loan from Bristol Rovers - and Richard Gilot were the scorers either side of the half-time as the Essex visitors were beaten to give the Rocks real momentum in their push for a play-off spot. In the Southern Combination premier a late Sam Ndlovu goal earned Chichester City a point in a 1-1 draw at Peacehaven after Curt Ford had scored for the hosts early in the second half. Their lead at the top was cut, though, as closest rivals Newhaven won 3-1 at Pagham, who had only a Harry Prisk goal to show for their efforts. 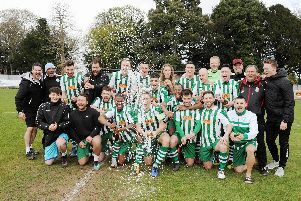 In division one there was no game on a weather-hit day for Sidlesham but Joe Bennett's goal earned Selsey a 1-0 home victory over Bexhill that took them up to fourth in the table. Midhurst went down 2-1 at home to Mile Oak after Kieran Carter put them ahead. Bosham were rained off in division two.